Right from the start, the four interlinking rings formed the trademark of Auto Union AG, the second largest car manufacturer in Germany, founded in Chemnitz in 1932. The rings represented the unbreakable bonds between the four Saxony-based automobiole brands - Audi, DKW, Horch and Wanderer. This insignia already stood for several decades of tradition in building cars and motorcycles, as well as the future of motoring. 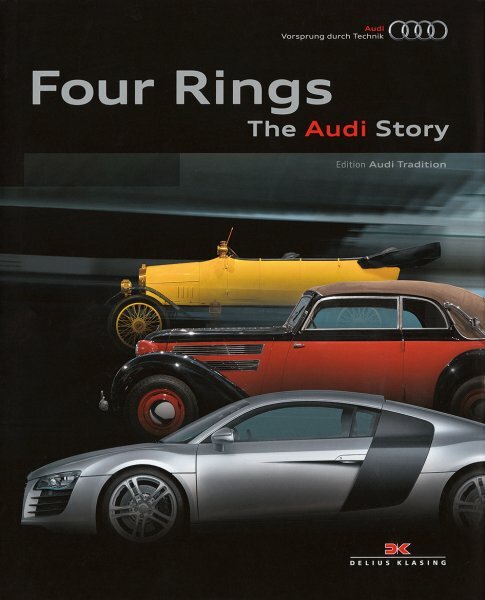 Today, Audi’s four rings still stand for the same message: an awareness of tradition and an eye to the future. The four rings represented the most complex offering from any German manufacturer, ranging from lightweight motorcycles to luxury automobiles and symbolizing the most varied corporate history in German automobile manufacture right back to the company’s roots. Its structures were so strong that it was able to sustain the new start necessary in Ingolstadt in 1945, in the aftermath of the Second World War – a short time later, Auto Union was back again with DKW. The absorption into the Volkswagen Group in 1965 heralded the re-birth of the Audi car brand and launched the upward trajectory into the upper echelons of automotive culture. Another thoroughbred marque, NSU, joined the VW stables in 1969. The cars built in Ingolstadt and Neckarsulm were fitted with four-stroke engines – diesel engines were added in 1989 – and brought the four ring brand unparalleled victory in the world market. To a certain extent, the brand’s spectacular sporting successes on both two and four wheels provide a unifying theme over a century of automotive progress. The quattro marked the start of the all-wheel drive wave, topping its market launch with a series of world championship titles. The modern Audi model range, from the A 2 to the A 8 and the R and Q types are all described in detail here. The marque's journey to become one of the most ubiquitous car brands in many countries of the world has been accompanied by numerous design prizes, as well as top car awards – and, of course, impressive scores in popularity surveys. The history of Audi is extensive, exciting and very informative in its content and includes plenty of information about the historical background of the company and its products. Readers will be guided through a century of history, enabling them to understand the changing economic situation during these years. The over 600 photographs and images play an important role here. The book is rounded off with a series of tables that make it an invaluable reference work.